In order to build a successful business, you must have a set marketing plan in place. 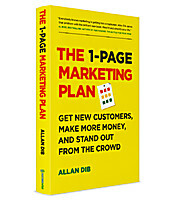 In The 1-Page Marketing Plan, author Allan Dib presents an easy and time-saving solution, useful to anyone in business; from beginners to experienced entrepreneurs. With just one page, you can map out a simple and reliable plan that will drive your business growth to the next level. How to get new customers and make more profit from existing ones. Strategies that work for small and medium-sized businesses.